Coat of arms of Tyumen Oblast was instituted on May 11, 1995. Tyumen (old blazon). Instituted on March 17, 1785, re-instituted on March 16, 1993. 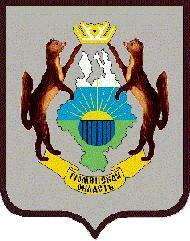 Tyumen (new blazon). Instituted on April 28, 2005 (modified on October 27, 2005). Ishim. Instituted on March 17, 1785. Omutinskoe. Instituted on November 25, 2004. Tobolsk. Instituted on March 17, 1785. Yalutorovsk. Instituted on March 17, 1785.